Leawo Blu-ray Ripper is a comprehensive, powerful Blu-ray ripping software which provide the easiest solution for you to watch Blu-ray and DVD movies on your own computer or portable devices on the go, accompanied with various wonderful and practical bonus features to improve movie enjoying and sharing. It lets you rip Blu-ray and DVD to common/HD video in over 100 popular formats for playback on various media players like iPhone 5, iPad mini, Lumia 920, Galaxy S III, Xperia Z, Surface, Nexus 4, Nexus 7, etc. Apart from video formats, Leawo Blu-ray Ripper can also extract audio from DVD to FLAC, MP3, WMA, WAV, AAC, OGG, AC3, etc. for play on any music players. With advanced disc protection removal ability, It could process Blu-ray content with AACS, BD+ and the latest MKB protection, and CSS-DVD as well. Besides acting as professional Blu-ray/DVD to video converter, Leawo Blu-ray ripper also works as practical video editor and 2D to 3D converter. It provides various video editing features to let users customize Blu-ray/DVD videos upon personal reference: trim video length to get desired video clips converted, crop video size to remove the black margin, adjust video effect by resetting Brightness, Saturation, Contrast and Volume, and add image or text watermark. Leawo Blu-ray Ripper also provides professional video and audio parameter settings to suit target players more: video codec, video size, bit rate, audio codec, quality, aspect ratio, frame rate, etc. With the advanced 2D to 3D converting ability, this Blu-ray ripper could easily convert 2D Blu-ray/DVD to 3D video in 6 different 3D movie effects, including: Red/Cyan, Red/Blue, Red/Green, Blue/Yellow, Interleaved, Side by Side. So you can enjoy 3D movies on various 3D players as you like. Ripping all Blu-ray and common DVD movies into most popular video and audio formats. Decrypting Blu-ray DVDs with the latest MKB. Play Blu-ray/DVD movies on any devices: phone, tablet, game console, etc. Leawo Blu-ray Ripper is normally priced at $44.95 per serial number / registration code. 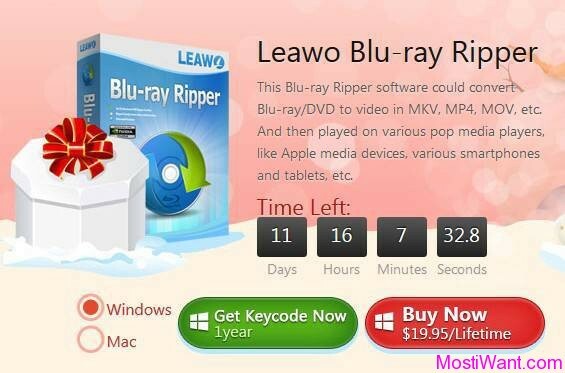 To celebrate this Christmas & the coming New Year, Leawo Software is launching special giveaway activity and discount offer where you can get Leawo Blu-ray Ripper For Free (Free 1 Year License for Windows & Mac). Meanwhile, this Halloween Special Offer activity also provides up to 70% off special sales on Leawo’s most hot sellers. Giveaway offer valid till January 7th, 2014. To grab a full version copy of Leawo Blu-ray Ripper, visit the Promo Page Here, select the version you want (Windows or Mac), and press the “Get Keycode Now 1year” button. Then enter your email address to receive your free full version registration code & download link for Leawo Blu-ray Ripper via email (Remember…check your spam, your code may send to this place after you sent the requests). You have to install and activate full version (please connect to internet to register) before the Giveaway offer for the software is over. Sorry but i was away and i think it’s too late now. Doesn’t matter, i wait for the next giveaway, i already have an older version of it. Thanks for your offer. Dear Pat, you are not late at all. This giveaway offer will be valid till January 7th, 2014. Happy New Year too 🙂 !! Doesn’t work for me, nothing send to my email, if i try again i get the message that there’s already a code send to my email-adress. I tried yesterday and today, but no email (also not in spam folder). Thanks anyway. Please use another email account (e.g. gmail). If it still does not work, please comment again, I’d be happy to apply one for you (registered with my email address). Dear Steve, it is the ripper for me. Anyway, I have applied a free license and sent it to your email. Please check for it.